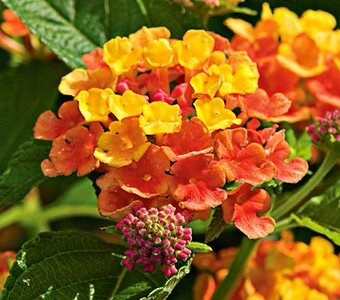 Lantana - Profuse color year round from masses of bright tangerine-colored flowers! Beautiful spreading form, useful in flower beds or containers. Excellent groundcover, accent shrub, or trailing plant over containers and walls. Works well as a tropical annual in temperate climates. Grows 2-3' tall and 6-8' wide. Gorgeous! Like the year round presence.